A lot has changed in the job interview process over the past few years. It's not unusual to be asked to participate in a video interview, to provide links to your social media pages in order to demonstrate your personal brand, or to do some sample work on spec to prove that you're qualified for the job. One thing that hasn't changed, however, is the need to send a thank-you note to your interviewers to express your appreciation for the opportunity to meet with them. The good news is that you can generally send your note via email–a paper letter isn’t usually necessary. A thank-you message via email has a couple of important advantages over the old-fashioned, paper-and-ink variety of a thank-you letter. For example, with an email, you can do more than remind your prospective employer of your qualities and skills–you can actually show them off by including a link to your online portfolio, LinkedIn account, or professional social networking profiles. Another benefit of a thank-you email is that you can get your thank-you message out immediately, rather than having to wait for the postal service to deliver a letter. In fact, you can send and write your thank-you email on the same day. This is crucial if you’ve just interviewed for a job in which the hiring manager will be making a quick decision. You want to send the letter when the interviewer’s impression of you is still sharp in his or her mind. You also want the interviewer to read the letter before making a hiring decision. This means that you should send the email message or letter within 24 hours of your interview. What if you’re interviewed by several people? First of all, ask for a business card at the conclusion of the interview–that way you'll have the contact information for each thank-you email. Then, send email messages to each person you interviewed with. 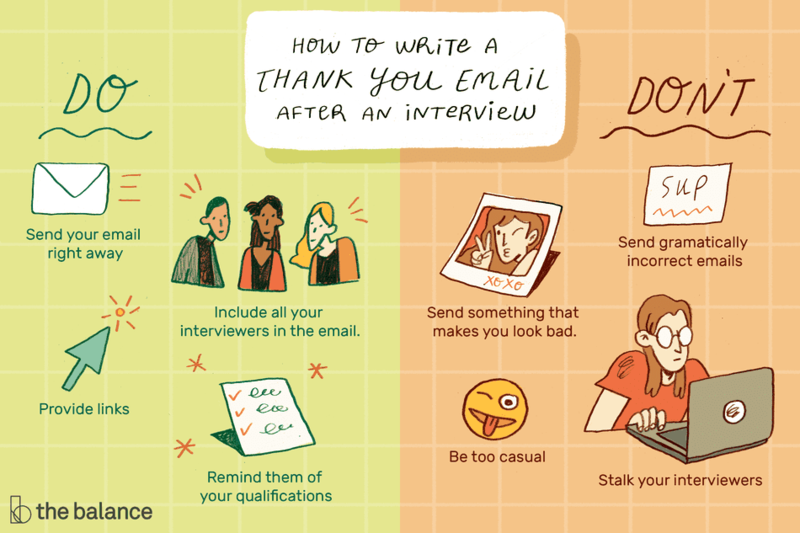 Be sure to modify your email so each interviewer gets a unique thank-you message. They will know if you sent the same message to each of them. In addition to thanking the person you interviewed with, your thank-you note should reinforce the fact that you want the job, so view this thank-you as a follow-up "sales" letter. In other words, restate why you want the job, what your qualifications are, how you might make significant contributions, and so on. Your message is also the perfect opportunity to discuss anything of importance that your interviewer neglected to ask. For example, if you didn’t have a chance to explain why you thought that you would fit in well with the company culture, you might briefly state this in the email. Finally, use your letter to address any issues and concerns that came up during the interview, including topics you neglected to answer as thoroughly as you might have wished. For instance, if you feel that you botched an interview question, you could explain your answer in more detail here. Keep in mind, though, that the thank-you note should be brief and to-the-point. A couple of brief paragraphs are sufficient. Here are tips for writing a strong thank-you email. Keep your message concise. The interviewer will not want to read a very long thank-you email. Focus on saying “thank you” and briefly reiterating your interest in the position. Remember to proofread. Proofreading is just as important in email as it is in other forms of correspondence. Be sure to check spelling and grammar. Also, keep a copy in your "Out" mailbox or “cc:” yourself so you have a copy of each message you've sent. The example below will provide you with a template to use for your own thank-you email. Keep in mind that this sample is only to give you a sense of how to format your email and demonstrate what information should be included. You’ll need to tailor it to reflect your own circumstances. I enjoyed speaking with you today about the assistant account executive position at the Smith Agency. The job seems to be an excellent match for my skills and interests. The creative approach to account management that you described confirmed my desire to work with you. Review more job interview thank-you letter samples for a variety of different types of jobs and employment circumstances. Send your email right away—within 24 hours of the interview—to thank the hiring managers and confirm your interest. Include all your interviewers in the email or send separate emails to each person who spoke with you. Keep in mind that if you do the latter, your messages should vary somewhat, so that the recipients don't compare notes later and feel like they just got a chain email (as mentioned above, it’s a good idea to gather business cards, or make a note of the interviewers’ names during the meeting. This is to ensure that you know whom to address). Include the name of the position in the subject line and the words "thank you." This will ensure that the hiring manager sees your response and knows that your email is important. Remind the interviewer of your qualifications, making sure to mention any keywords in the original job listing (or those that came up during the interview itself). Provide links to your online portfolios and other professional sites and networks. Stalk your interviewers. Initiatives such as a thank-you email and a follow-up a week or so later are more than enough. Beyond that, you're not promoting yourself; you're stressing them out. Remember that your goal is not only to show the hiring managers that you’re qualified but to convince them that they want to work with you. Repeatedly hounding them with follow-up emails won’t build your case. Send anything that makes you look bad. This includes personal social media profiles that contain unprofessional pictures or behavior. Err on the side of caution when determining this. You might see nothing wrong with a photo of you enjoying a margarita on a tropical vacation, but the hiring manager might feel differently. Be too casual. No memes, internet acronyms, etc. Send misspelled, grammatically incorrect emails, or anything that hasn't been proofread by a trusted friend. Even professional editors make mistakes when they try to work on their own. Get another set of eyeballs to look over your work before you hit "send." By sending a thoughtfully expressed “thank-you” email immediately after your interview, you’ll affirm the positive impressions you made during your talk, keep your candidacy “top of mind” as final hiring decisions are made, and demonstrate that you have the good manners and proactive communications skills employers desire in their personnel.